Semifreddo, which means half cold, is an Italian dessert that combines meringue & whipped cream to form a texture similar to a frozen mouse. It can be made in a variety of flavors but I love the mixture of crunchy pistachios and the hint of almond in the recipe below. Semifreddo is a wonderful dessert to make in the summer when you don't feel like turning on the oven or dragging out the ice cream machine. In just minutes of mixing and a few hours of freezer time you get a silky, sweet, melt-in-your-mouth dessert that you'll want to eat every day. Although delicious on its own, I highly suggest topping the semifreddo with a drizzle of dark chocolate and serving it with some cognac cherry compote. Line a loaf pan with plastic wrap, leaving an overhang on each side. (I also placed a strip of parchment paper on top of the plastic for smoother sides). In a small food processor, grind 1/2 cup pistachios with 1/4 cup plus 1 tablespoon sugar until very finely ground. Pour into a bowl. Coarsely chop the remaining 1/4 cup pistachios and combine with the finely ground mix. Gently fold meringue and nut mixture into whipped cream. Pour into prepared loaf pan and smooth the top with offset spatula. Place in freezer until firm, about 8 hours. Run a thin knife or small metal spatula around the edges of the pan to loosen. Invert onto serving plate and carefully pull off the plastic wrap and parchment. Garnish with chopped pistachios. Drizzle with melted dark chocolate and serve immediately with cognac cherries. Stem, pit and chop the cherries. Place them in a saucepan with sugar over medium heat. Cover and cook for 10-15 minutes, stirring them frequently. Remove from heat and stir in the cognac and almond extract. Let cool before serving. Compote will thicken as it sits. Ooooh, this sounds amazing!! What a great dessert for a dinner party! Oh my gosh!! I need some of this in my life right now!! I can't believe I have never tried this! I just love semirfreddos. You do not see them that often and you prove how elegant they can look. I love semifreddi! I always make the same strawberry/meringue version though! Need to branch out! Love how light and delish this is... and that no oven is required! Perfect summer dessert. Love this - especially that drizzle of chocolate! This looks amazing. I'm a serious pistachio nut. OMGoodness! Beautiful plating and sounds delicious! 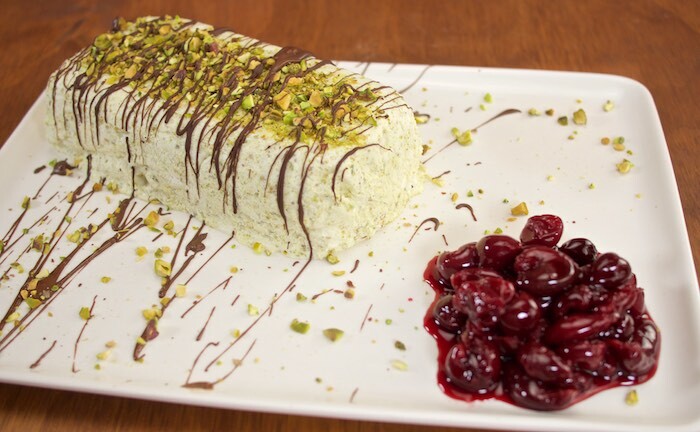 I love everything about this semifreddo! Pistachios are delicious and those cognac cherry compote has my name all over it! Such a pretty, elegant dessert! Pinned, and absolutely can't wait to try this recipe!